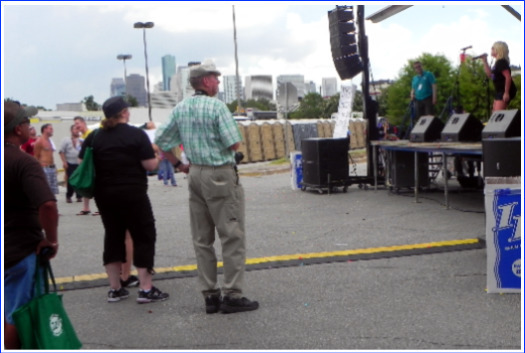 Throngs of people await the beginning of Pride Houston’s LGBT Parade 2015. Previous years, I would have said “lined up,” but there was no lining up for the masses that came to downtown Houston to be part of this event on this historic occasion. 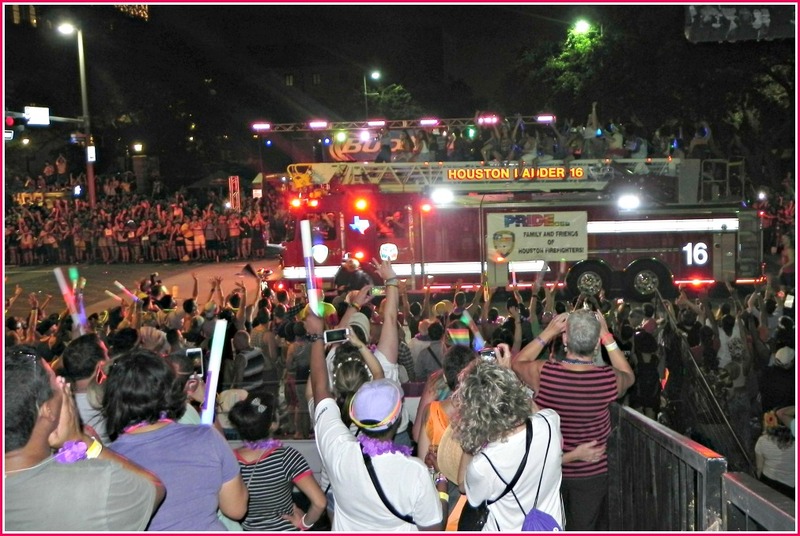 On the heels of the only one-day-old Supreme Court’ announcement of marriage equality for the entire country, Houston was revved up for PrideHouston‘s showcase events, the festival and the parade. 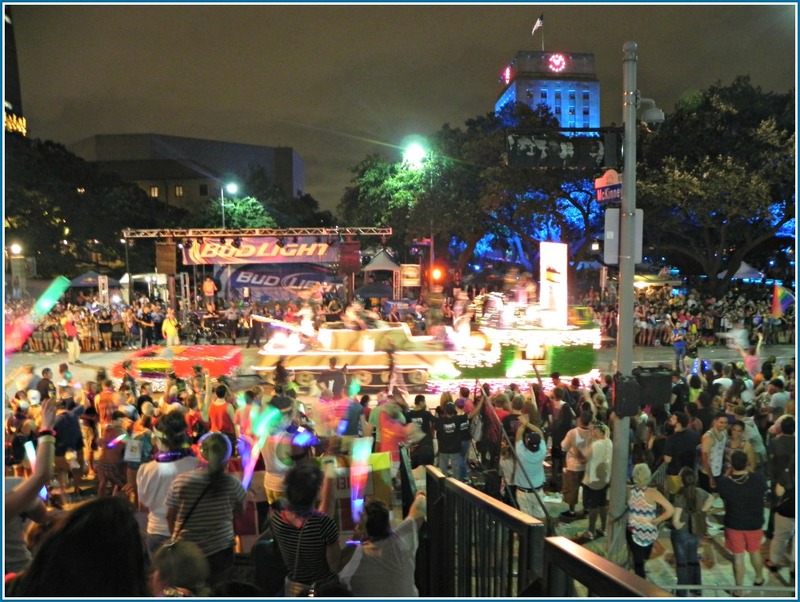 Besides tremendous legal decree, another major change for the Houston LGBT events was the move from the Montrose “gayborhood” to downtown Houston. i, personally, made some changes. 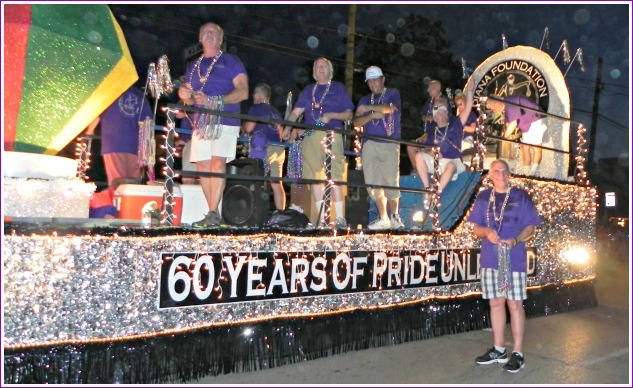 Although for years, I had lived in Montrose and walked the few blocks to the parade, later I moved a bit further away and had to drive to Montrose, find a parking place, usually many blocks away, and then make the walk to Westheimer Road to view the parade. Now for last six years, I’ve been 25 miles out in the suburbs and making the effort to go take in all of the parade is an even bigger decision. I always love the feeling of being amongst “my people,” something that I don’t have out here, but when I think about standing out in the Houston heat and being jostled around by drunk straights, I have doubts about going. These guys wanted me to take their photo from my perch on the bleachers, and I was happy to comply. 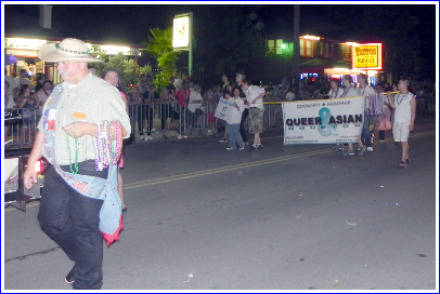 They were just part of the excited, very diverse of parade attendees. Mostly, though, I want to go, and this year, I decided that getting tickets for the Friends of Pride VIP bleacher seating was worth the cost. In fact, it was. With an open bar, all kinds of buffet food, incredible music, decent restrooms, and a gift bag to be filled with all kinds of LGBT chucherías. 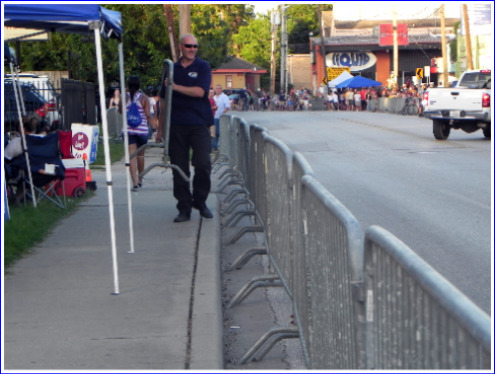 The bleachers, though further back than the edge-of-sidewalk view that I had always taken in years past was a great vantage point, just across from the main stage, to enjoy all of the parade entries. 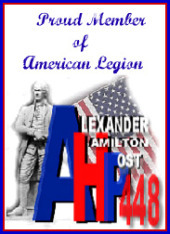 In fact, the mood of the event was of tremendous celebration, very much a victory celebration, and obvious harmony among all, even event organizers and law enforcement I haven’t seen an attendance number estimate but from the throngs of people packing the downtown streets, there must have been many more attendees than last year’s 450,000. The parade entries were diverse in types, many new ones added to those of previous years, with emotional members that kept giving off their excitement embed by that of all those smushed together along the sides of the streets. 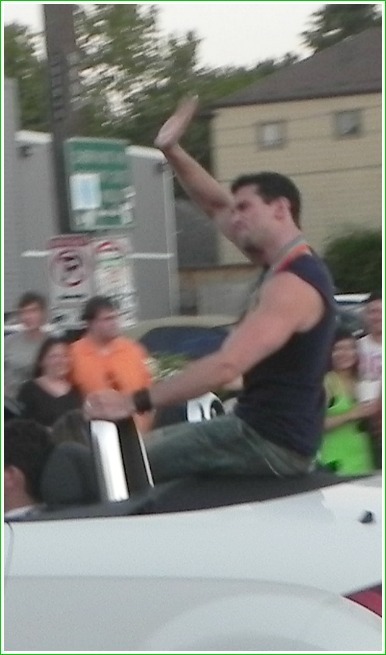 It really was one of the best, perhaps the best, of all the parades I’ve been able to enjoy. Mayor Annise Parker and wife Kathy Hubbard greet parade attendees. Competition to replace Mayor Parker when she leaves office (due to term limits) appears to be fierce as evidenced by the large number of candidates who appeared in the parade, trying to garner attention and possible votes. 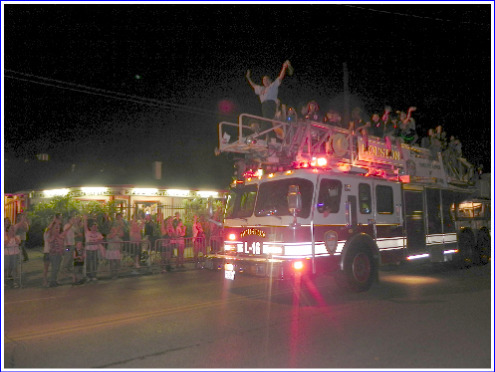 HFD’s Ladder Truck 16 carries associated revelers on top as it makes it way down the Pride Houston Parade route. 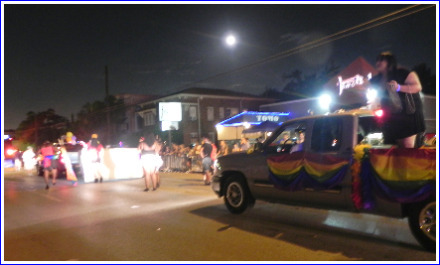 One of the many floats in the parade with Houston city Hall lit up in rotating rainbow colors in the background–I really don’t care that from my viewing spot many of my photos weren’t very good. It was a great place to have fun and enjoy the atmosphere of the entrée event. 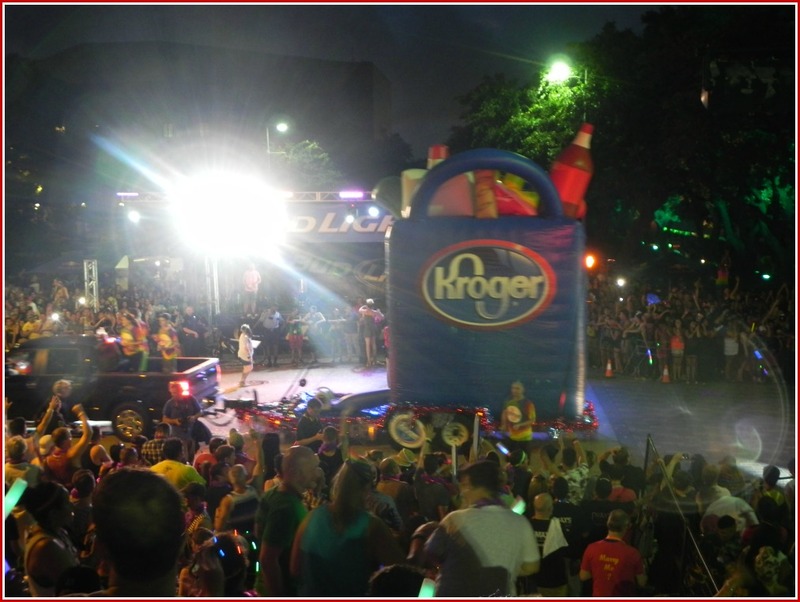 One of the many commercial entries, Kroger brought its bad of groceries to the parade. Record heat hit Houston on Saturday, but that didn’t deter the largest crowds I’ve seen in almost 30 years of attending this city’s gay pride parade. Last year, I passed on heading back into the city for a sixth commute of the week, only to fight the heat and the parking. I just needed to get back this year to be part of the throngs of kindred spirits. Putting on cool clothes and filling a small backpack with my camera and bottles of water, I set off out into the 107 degree heat. After picking up a friend on the way, I headed down to the old Montrose neighborhood, where I had spent many of years in Houston, and site of the pride festivities. I knew that the crowd would be large when I couldn’t find a parking place anywhere near my preferred area. We finally found a space, got our gear together, and walked further than sensible people should walk in over-100-degree heat. 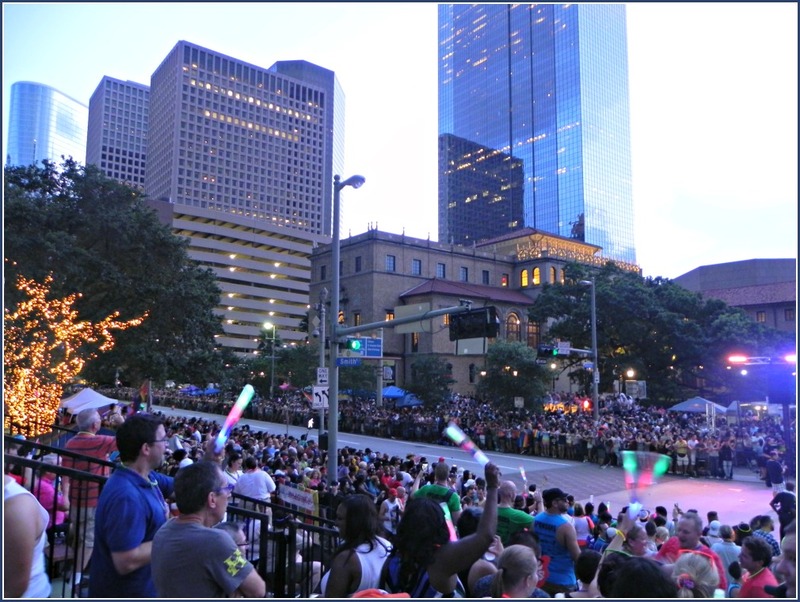 My perception was that the crowds were about the most diverse that anyone might find any place in Houston. And while the attendees at the parade 2 years ago seemed about half gay-half straight, the ratio this year appeared much greater in the gay direction. That might be because of positive decisions that just came out of the Supreme Court only a few days ago. The parade got going even before the stated 8:15 start time and even finished before 10 but seemed to have as many entries and as much excitement as previous years. The photos that follow give only a taste of the evening; the Houston Chronicle has a good page up that highlights a lot of days festivities. 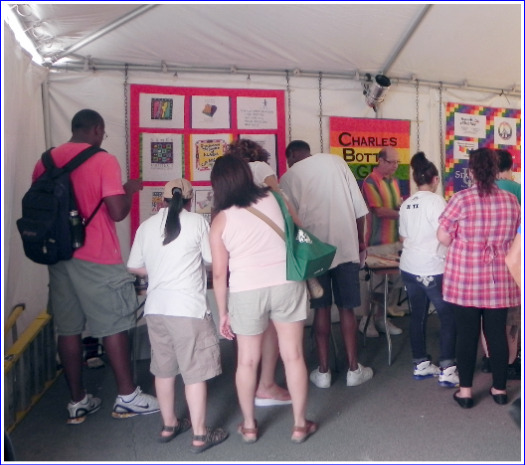 *The Houston Chronicle reports that more than 400,000 attended this year’s event. This is sure to be a Houston Pride Parade record. 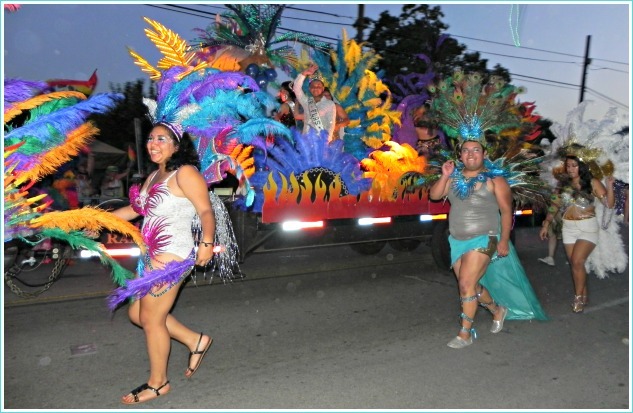 The diversity among us–parage attendees applauded entries,, screamed for beads, and celebrated throughout the evening. They have to be, though, some of the best behaved hundreds of thousands of people around. 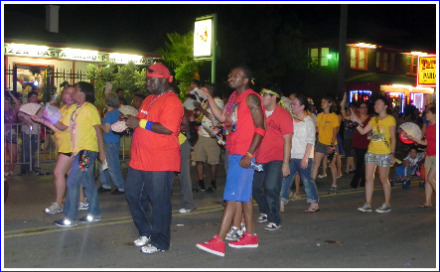 As the crowds of spectators await, HPD heads down Westheimer, leading off Pride Parade 2013. The pride of Houston’s LGBT community–Mayor Annise Parker (left) and her partner, Kathy Hubbard. PFLAG–one of the wonderful ally groups that have been supporting for years. There was no lack of the rainbow colors. Just one of the many attractions to be found on parade evening. 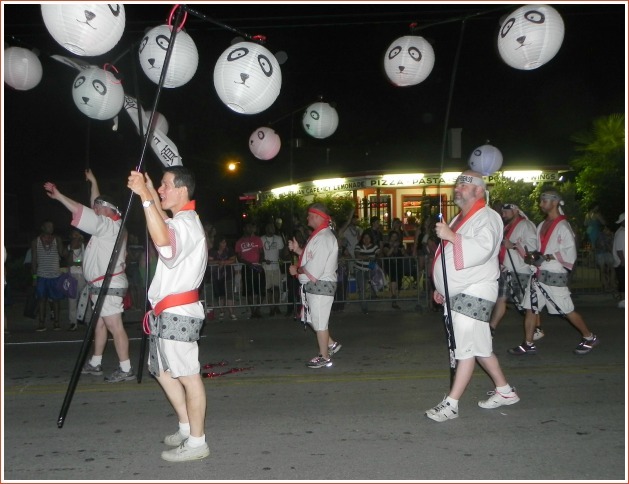 There was no shortage of commercial groups taking part in the parade. 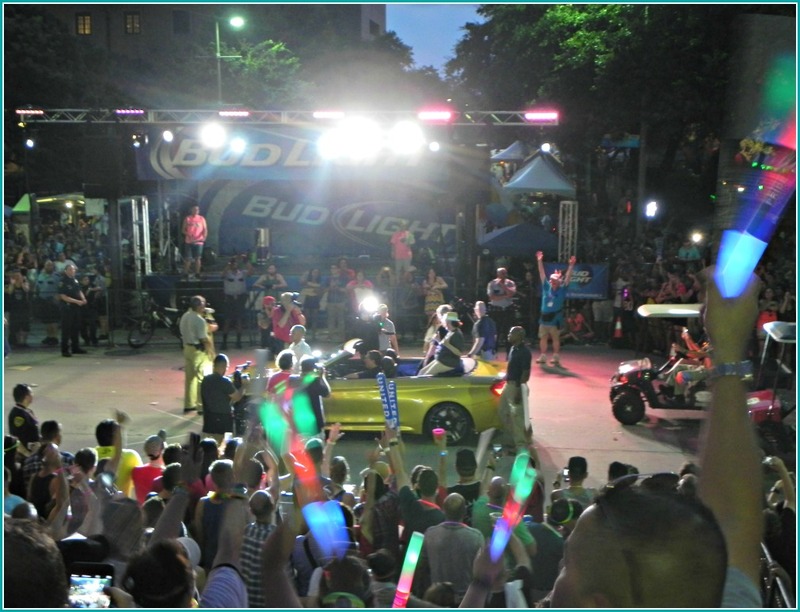 Houston Gay Pride Parade 2011 is off and running!Jonathan Lovitz, from LogoTV's "Set Up Squad" was one of this year's honorary grand marshals. 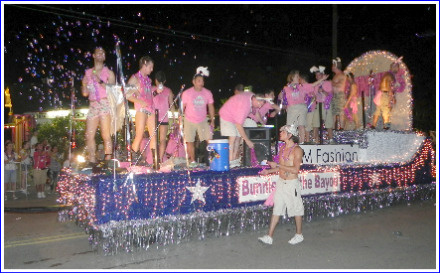 The 2011version of the Houston LGBT Pride Celebration (commonly known as the Houston Gay Pride Parade) was attended by a large crowd. (I’ll be interested in what the official count will be.) 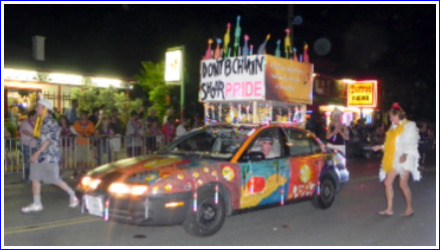 The parade was lead off by the traditional HPD cruiser and contingent, followed directly by Houston’s own gay mayor, Annise Parker, with her partner, Kathy Hubbard at her side. The crowd gathering before the start of the parade, here in front of Tomo's. 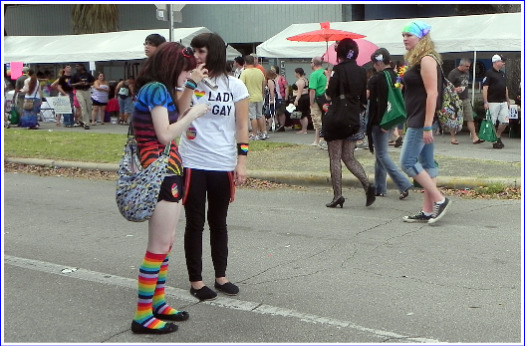 A broad mix of people came to view the Pride Parade. A few of them entertaining themselves before the start. 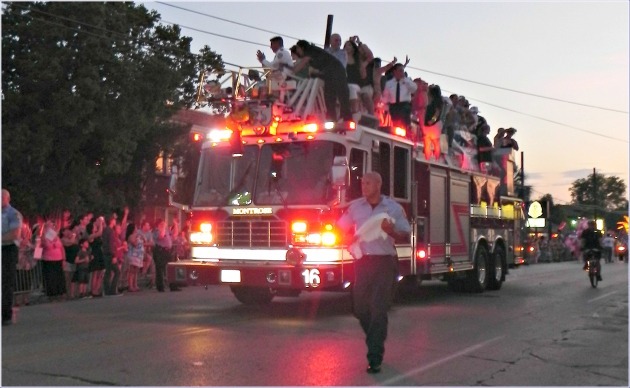 The unexpected is always expected at the parade. Jonathat Lovitz, of LogoTV's "Setup Squad", one of the honorary grand marshals. 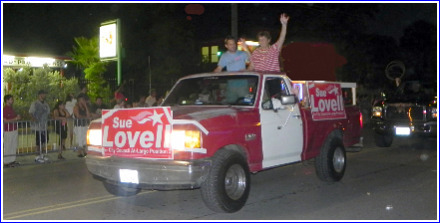 There was no lack of other politicians riding in the parade, including many of the current city council, and council wannabees, as well as state representatives and congresspeople. 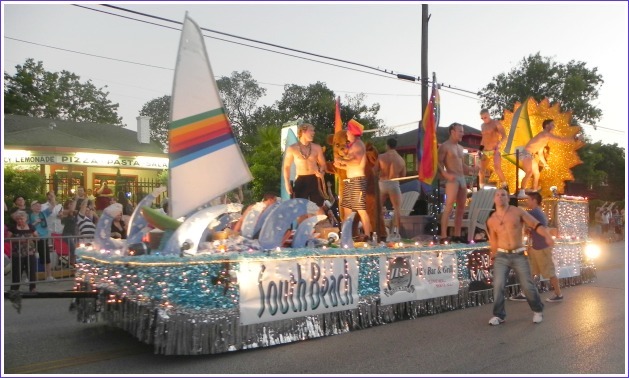 There were a large number of groups representing a wide variety of gay interests, many who have participated year after year. However, every year there are new participants. Many things have changed about the parade have changed over the years. For one there is a lot less police “presence” along the parade route. Maybe that’s due to having a gay mayor. There are perhaps more straight people than gay people that attend these days. 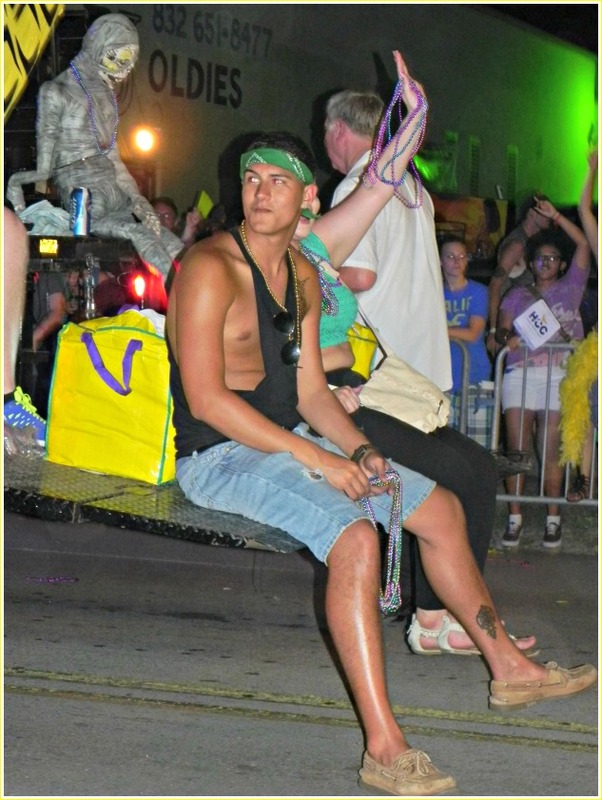 Sometimes, I wonder if they are really interested in the groups, or just want to get the beads that are thrown. I saw more drinking than I have seen before, as illustrated by a 50-something woman, who eased in next to me, and screamed at every float or group. Her name was Julie. Yes, that’s what she screamed, “Hey, it’s me Julie.” I hope she enjoys all her loot. 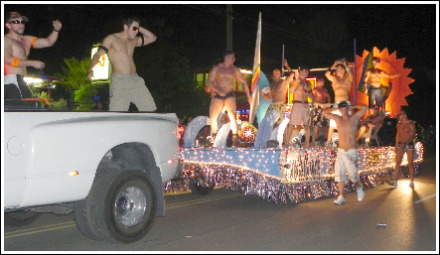 Yes, the Gay Pride Parade has changed. 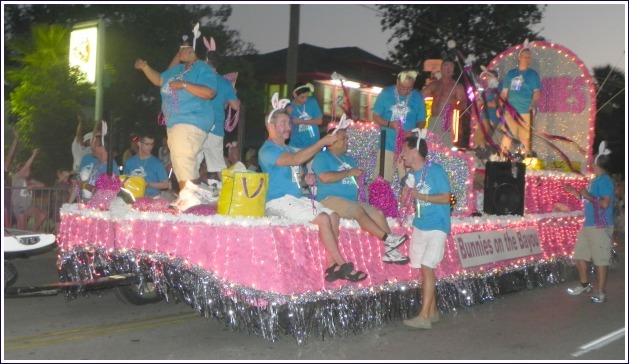 The colorful float of Bunnies on the Bayou. Gay Asians & Friends--this group is uniquely costumed year after year. 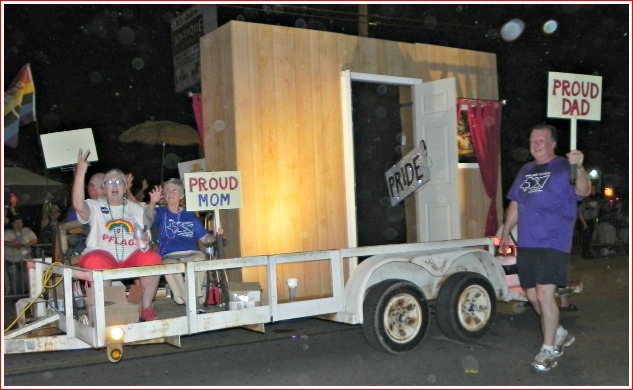 The Texas Gay Rodeo Association's entry. M.D. 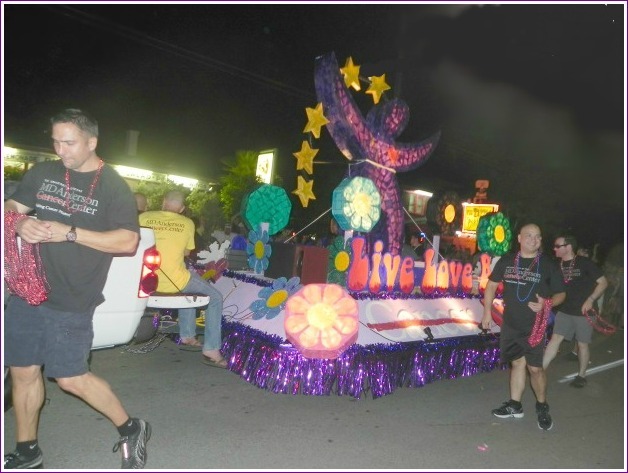 Anderson Cancer Center's entry illustrates the parade theme "Live, Love, Be." A perennial favorite, the boys of South Beach. 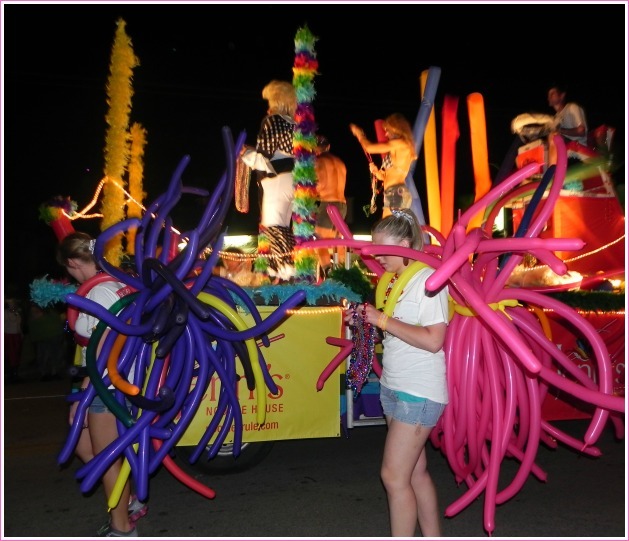 One of the many colorful contingents in the parade–this one is Jenni’s Noodle House. See story and photos of 2010 Pride Parade here. 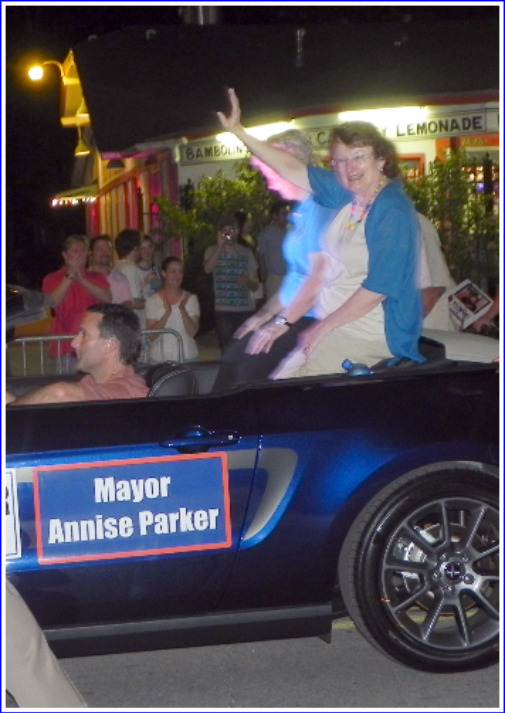 Mayor Annise Parker, who was one of the honorary parade marshalls, and her partner Kathy Hubbard rode in one of the lead convertibles, and having a gay mayor seems to have positively affected many aspects of the parade. There were many more elected officials in the parade than ever before. 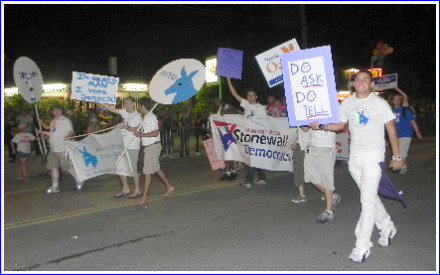 And while, yes, it is an election year, I got the feeling that many of them were there because, now with a gay mayor, it’s “OK” to take part in the parade, and they also see the value of gay voters. 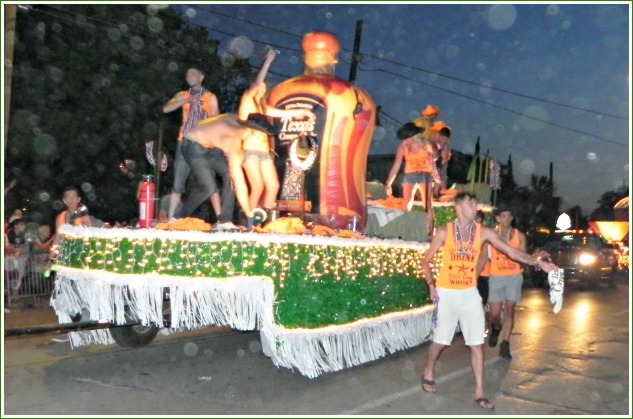 The parade entries represented a much broader spectrum than I’ve ever seen, from the traditional motorcycle and leather groups to businesses including a funeral home disco bus to a wide range of religious groups including Buddhists and (I think) pagans. 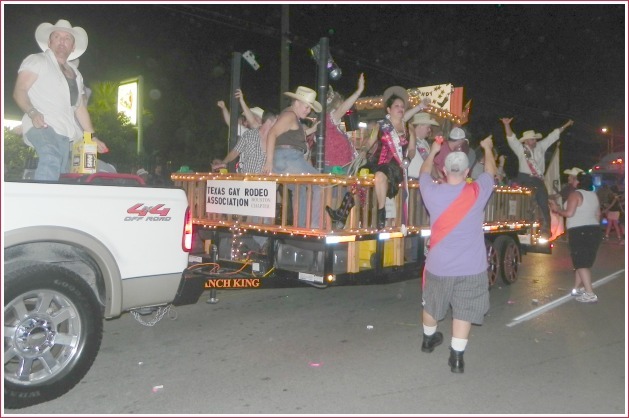 old, sober, drunk and many other types, who were happily moving to the beat and catching tossed beads. 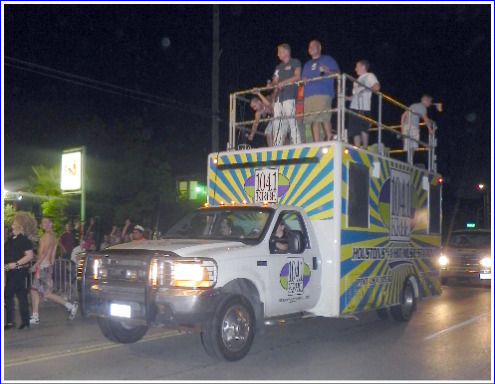 However, unlike last year, the atmosphere this year was one of festivity and communal enjoyment among among parade participants and spectators alike, rather than just a mad scramble to get the “loot’ tossed from the floats, as was my take on last year’s event. I'm not exactly sure what was happening, but I turned around and encountered this scene. interacting a lot with parade goers. 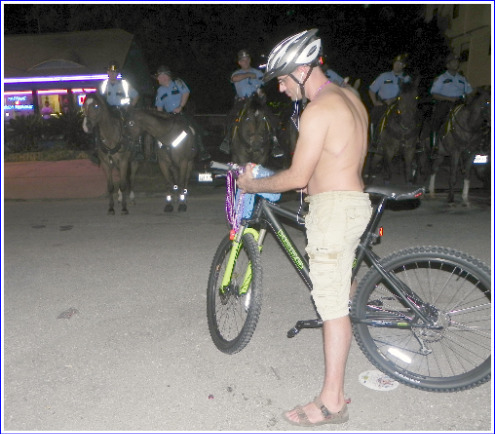 This year there were no police on horseback out patrolling the street, after last year’s accident in which a woman watching the parade was trampled by a police horse. 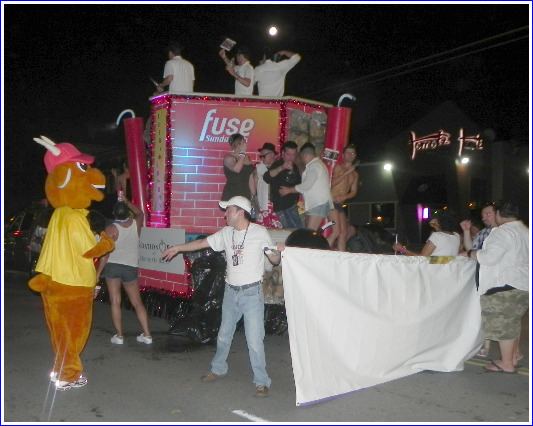 Though one of the surprises of the evening was when I turned around and seven or eight of them were lined up behind me on the corner of California and Westheimer. One of the great things about the parade this year was seeing the broad mix of people both viewing and participating in the parade. 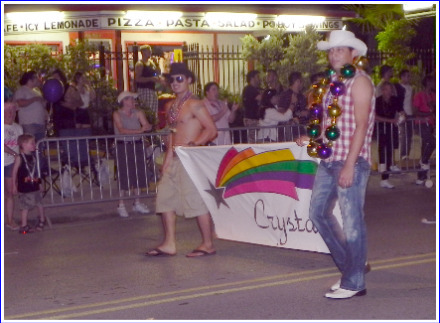 This diversity, somewhat due to the popularity of Mayor Parker, shows that more and more Houstonians see gay people and gay events as part of the entire Houston community, not “apart from” as has been the case in the past. 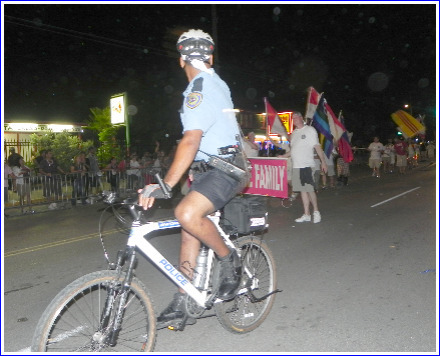 Bicycle Patrolman and Gay Asians and Friends (Houston--the city big enough for Gay Asians and Queer Asians (Now how much more diversity could one want?) But guys, you're really going to have to work hard to beat the Hello Kitties from last year. Previous mayor of Houston and now gubernatorial candidate, Bill White, strides down the parade route, as he had done when he was Houston's highest official. One of the best dancin' groups of the night--Gay Buddhists--I think, but not sure--my bad. Where else but Montrose? 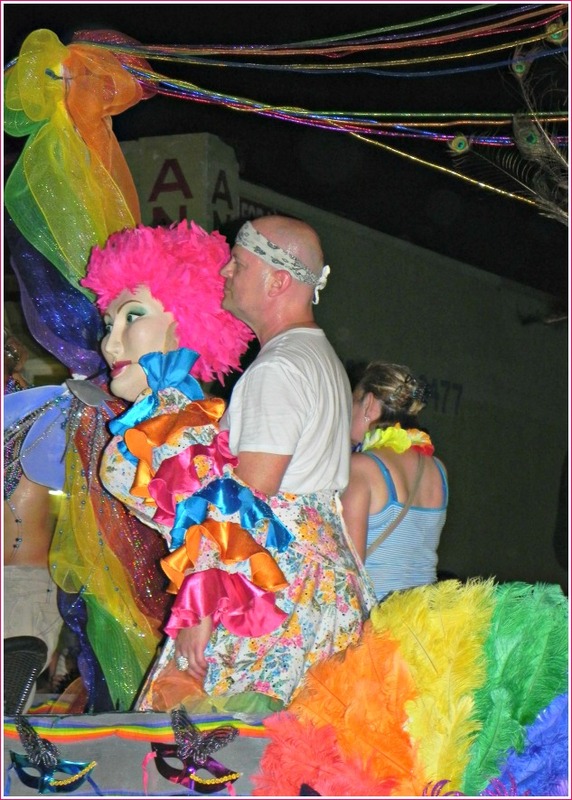 Where else but the Gay Pride Parade? 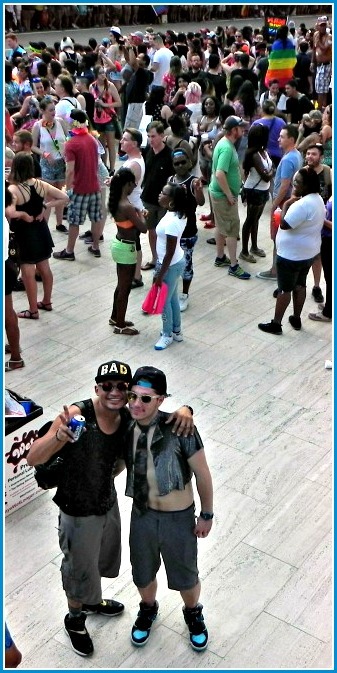 See story and photos of 2011 Pride Parade here. 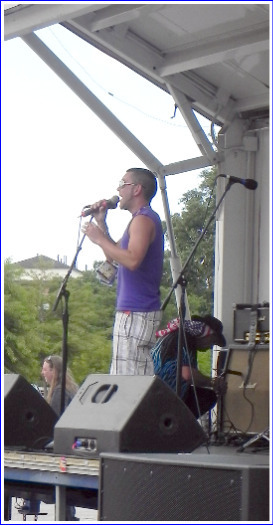 Trekked into town around 1 PM to check out Houston (Gay–the word they don’t seem to want to put in the name) Pride Festival 2010. 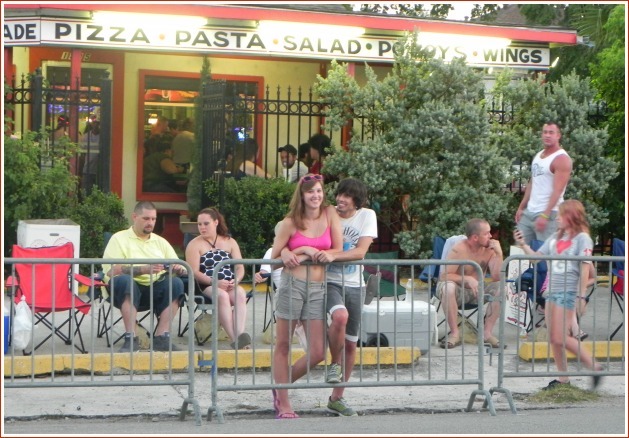 I was surprised at how many people were already setting up lawn chairs and sun shades along Westheimer, apparently claimstaking their spots for the parade, which is to start at 8 PM this evening. sun, about a half an hour is all that I’ll stand; this year proved a bit different because the entertainment on the stage was quite good. One way to beat the heat was to get inside at the History and Art Exhibit. In addition, special thanks definitely have to go out to Walgreen’s, who had people stationed around the festival handing out green bags with an icy bottle of water inside, not to mention a 15% coupon. This is just my comment and not any kind of advertisement, but Walgreen’s and “Disco” Kroger have long been part of what makes Montrose unique. 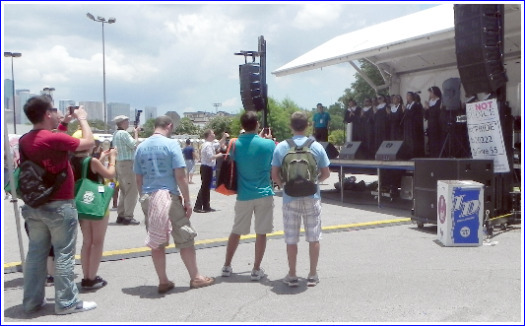 The Houston Gay Men’s Chorus did a couple of highly entertaining numbers, followed by contestants from Pride’s Gay Idol, the winner of which, Brittni Jackson, has a voice which could compete with most on TV’s American Idol. around at the people there in the heart of Montrose, a wave of nostalgia came over me of the long-since gone Westheimer Street Festival. 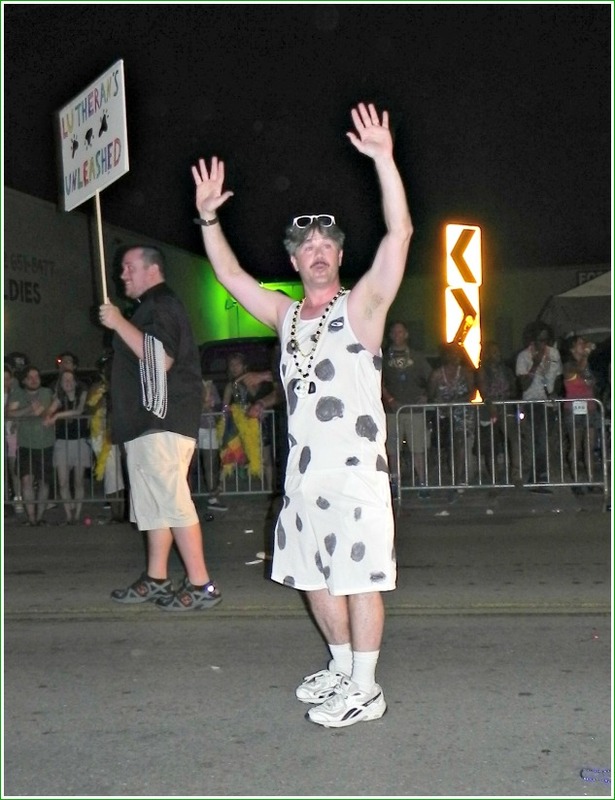 Today’s Houston Chronicle says the predictions for this evening’s parade might go as high as 250,000 attendees, partly owing to Houston having Annise Parker, the recently elected, openly gay mayor. Thinking about how early I might have to go back into town to find parking and the thunder booming outside, I’ll have to make a decision, but the few times that I haven’t gone, I felt like I was missing something. But hell, I bought a new shirt to wear. Yep, I’m still gay. A big surprise for me is that giving the prayer for the inauguration was Joel Osteen of Houston’s mega Lakewood Church, which is now housed in the building that was the previous arena for the Houston Rockets of the NBA (the Summit, later called Compaq Center). I put this in almost the same category as Rick Warren giving the convocation at President Obama’s inauguration just a year ago. It was only a couple of months ago when Osteen appeared on The View and said, “. 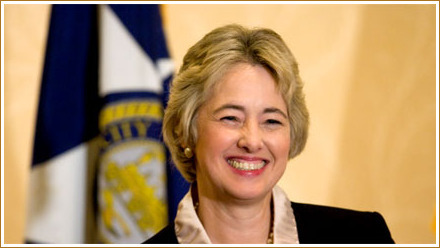 . . homosexuality is not God’s best.” If Osteen doesn’t think Annise Parker is one of God’s best, why did he consent to give the prayer at her inauguration? Also why was he picked to speak by those doing the planning? Osteen has a big draw in Houston, and I know some gay people that go to Lakewood. I also know gay Catholics and gay Mormons. I don’t know why gay people would want to belong to a church whose leader doesn’t think they are God’s best. I also don’t know why gay people want to belong to any church that keeps hammering them down. Speaking of hammering, some of the Phelps clan from Topeka’s Westboro Baptist Church are in town to protest Annise Parker’s inauguration. However, the Phelpses aren’t one-stop shoppers when it comes to hating; according to their website (the name of which is such a pejorative that I would not deign to give them the satisfaction of writing it), they are making a 2-day trip of it in order to picket a wide spectrum of venues, which include among others, the Co-cathedral downtown, the Holocaust Museum, the Anti-Defamation League, a Jewish school, and even Osteen’s own Lakewood Church.